Object Name: Double Star HR 7169 & 7170 in Corona Australis with NGC 6726, 6727 & 6729. Media: Light pencil on white paper, scanned to GIMP, and color inverted, Labelled in Mac Preview. Notes: This sketch was executed with a Celestron C925 on a CGEM with a Swan 40mm EP and a Williams Optics 45º erecting prism diagonal at 58X. The wind was 10mph, Temp: 47ºF, Humidity 24% under a first quarter moon at 2130. The Lit. Rho is 12.8″, Theta is 280º. I measured the pair with a Meade 12mm Astrometric EP and obtained an average Rho of 14.8″, and average Theta of 218º. 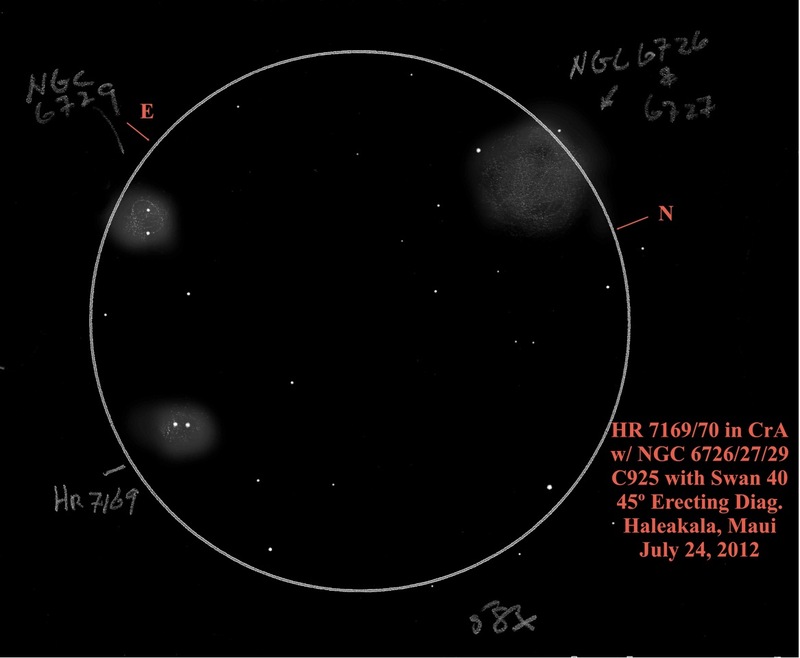 I am interested in the nebulosity of the three NGC objects that are included in the field of view. I plotted 25 field stars including one outside the F.O.V. to the west and two outside the F.O.V. to the WSW. I enjoyed your detailed sketch of these doubles with nebulosity. Nice work! Wonderful sketch of the double star duo with nebulosity! Really good to see your sketches appearing on ASOD!